In the highly competitive vendor landscape of the global market for thermally conductive plastics, the rising number of companies is likely to play a key role in bringing down costs of products and opening up several new growth opportunities as cost-conscious consumers become more open to using these plastics as alternatives to other materials, observes Transparency Market Research in a recent report. Companies in the market could benefit from the rising demand across the electrical and electronics and automotive sectors. Increased focus on growth opportunities across emerging economies could also play a key role in helping companies establish their dominance in the market. Prominent players in the market are Koninklijke DSM N.V. (Royal DSM), Celanese Corporation, Poly One Corporation, Toray Industries Inc., Kaneka Corporation, SABIC Group, E.I.du Pont de Nemours and Company, Exxon Mobil Corporation, and Arkema Group. According to the report, the global thermally conductive plastics market was valued at US$838.8 mn in 2016 and is projected to reach US$2,634.3 Mn by 2025, at a CAGR of 13.8 % from 2017 to 2025. Based on type, the segment of polybutylene terephthalate (PBT) accounted for the dominant share of the global thermally conductive plastics and is likely to continue to lead. The demand for polycarbonate and polyetherimide is also propelling owing to demand from electrical and electronics and automotive industry and the segment is expected to exhibit growth at a healthy pace over the forecast period. Geographically, the Asia Pacific market held the dominant share of the global thermally conductive plastics market in 2016. Growth in this region can be primarily attributed to increasing use of thermally conductive plastics for applications such as manufacturing electrical devices and bumpers of cars in automotive industry. 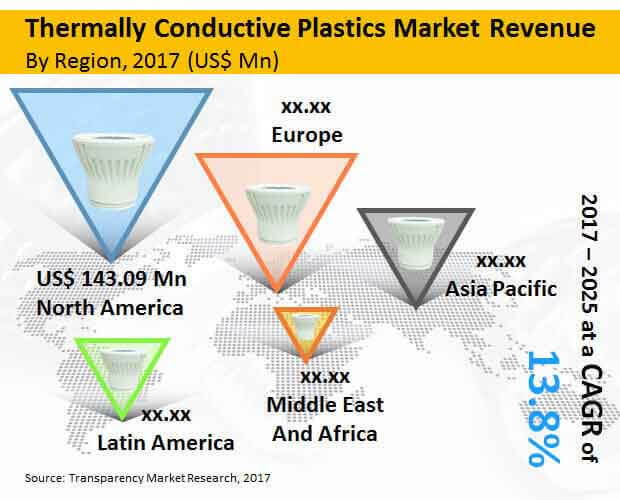 Factors such as the increasing demand for smart electronics, easy availability of plastic feed stock, and increasing investment of the plastic manufacturers in the region are also estimated to boost the market for thermally conductive plastics market. The global market for thermally conductive plastics is chiefly driven because of the increased demand for smart solutions in end-use industries such as electrical and electronics and automotive. Increased preference of the global consumer to lightweight products is also spelling growth for the global thermally conductive plastics market. The thriving automotive sector and the increased uptake of personal cars across emerging economies has also acted as a key driver for the market as a variety of thermally conductive plastics finds extensive usage in all varieties of vehicles, more so now owing to the increased inclination towards lightweight vehicles. The market has also massively benefitted from technological advancements and the vast rise in investment in the field of research and development from companies wanting to strengthen their positions in the increasingly competitive market. However, factors such as volatile costs of key raw materials could act as a prominent restraint for the global thermally conductive plastics market. The final cost of the product substantially rises with the rise in processing and development costs and most thermally conductive plastics are manufactured from crude oil. As such, the rapidly varying costs of crude oil and the complex and costly manufacturing and processing costs of crude oil derivatives continue to remain a key challenge for companies in the global thermally conductive plastics market.